These reissues from around 30 years ago clearly represent a major set containing performances by major artists. At less than �30 for 9 CDs, this is also a real bargain, containing Beethoven's duos and his piano trios, along with a superlative performance of the Tchaikovsky Piano Trio. Although the Beethoven collection is not absolutely complete, since it omits the early (pre-Vienna) Trio in E flat and the composer's arrangements of the Opus 11 Clarinet Trio and of the Second Symphony, all the important works are here. Anyone wanting the other items too can investigate the recently reissued and equally distinguished Philips collection from the Beaux Arts Trio. In the Trios, and throughout the set, Daniel Barenboim is the central figure, in terms of performance as well as recorded sound. The tempi give the impression of emanating from his decisions, and while the balances are never less than satisfactory, the piano tends to take the leading role in the sound picture. This is not a criticism, merely an observation of a slightly different emphasis for neither the cello nor the violin is recessed in sound. The performances are consistent, both in terms of the quality of the playing (would one expect less from these players? ), and the interpretations. The latter give particular emphasis to the personalities of Beethoven's melodies, which are generally accorded a higher priority than either the line of development or the vitality of the rhythmic propulsion. Accordingly, for example, the first movement of the great Archduke Trio is given a broad tempo, which is fully justified by the intensity of the playing. All three players communicate their special qualities, and another highlight comes in the slow music of the Ghost Trio, Opus 70 No. 1, in which Zukerman contributes a wonderfully veiled and mysterious tone. However, these players are never found wanting when virtuoso rhythmic attack is required. A particularly enjoyable example is to be found in the wonderfully inventive rhythmic propulsion which underpins the finale of the early Trio, Opus 1 No. 2. This also offers a useful reminder of how dangerous it is to underestimate the music Beethoven composed during the 1790s, the music of his so-called 'first period'. The cello sonatas were recorded at the Edinburgh Festival, in August 1970. By then Du Pré's short career was reaching its later stages, but her performances are rich-toned and full of commitment. Again Barenboim's contributions confirm that accompaniment is not an issue in Beethoven's chamber music, for this is a true partnership of equals. On many occasions, not least in the final pair of sonatas, Opus 102, the piano writing is as distinctive as in the later sonatas, and Barenboim relishes his opportunities. These live performances occasionally, but not too irritatingly, suffer from audience contributions, while the recordings are warm and ambient. The performances tend to play the music for all it is worth, just as in the trios. The Zukerman-Barenboim partnership has much to offer in the violin sonatas, and here too the music making has abundant personality and flair. More often than elsewhere in the set, the tempi can be prone to exaggeration, the phrasing sometimes mannered, as if the artists were trying to wring the last drop of emotion from the music. This approach can tire, since for all his dramatic intensity and personal sensibilities, Beethoven remains a classical composer. The best of all these duo performances is probably the great Kreutzer Sonata, Opus 47, whose larger scale suits the romanticised approach best. 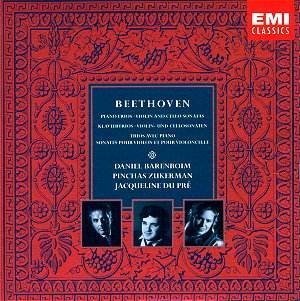 Good though the Beethoven performances are, there is something special about the Tchaikovsky Trio that makes it the jewel in the crown of this substantial collection. Tchaikovsky composed the music as an 'in memoriam' piece for his friend and fellow artist Nikolai Rubinstein, and this performance has a wonderfully imaginative sweep and flair. There is abundant concentration too, for one of the chief challenges facing performers in this music is the extensive 50-minute span, contained within only two movements. The set comes in a handsome box, with a well-designed booklet containing an interesting essay about the artists, written by Tully Potter. However, those requiring information about the music itself will need to look elsewhere.